Add new products, modify product information, setup categories, and manage your store's inventory. 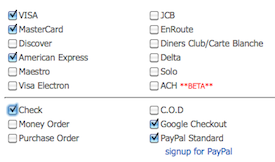 To process and manage orders click the view/process orders link or click one of the order status links below. View customer information, and order history. View and manage subscription information. Import product data and inventory. Export product information, customer data, and store orders. View customer and order information on your mobile phone. Get a merchant account to take credit card orders from customers in your online store. We have partnered with the leading merchant account company on the Internet to provide you with a merchant account so that you can take orders on your website. They offer extremely competitive rates. Apply for your merchant account after activating your website.